The Bishop’s Appeal is a fundraising campaign; which each parish is asked to undertake to invite parishioners to support the operational needs of the larger Church of Green Bay. The Bishop’s Appeal impacts the faith lives of families, individuals and communities throughout northeastern Wisconsin. As of Tuesday, March 26th 207 households (41%) at St. Matthew have donated towards our goal. Stay up to date with the progress by checking out the chart in the gathering space and our Facebook page. We hope to have participation from all 500 St. Matthew Parish households. 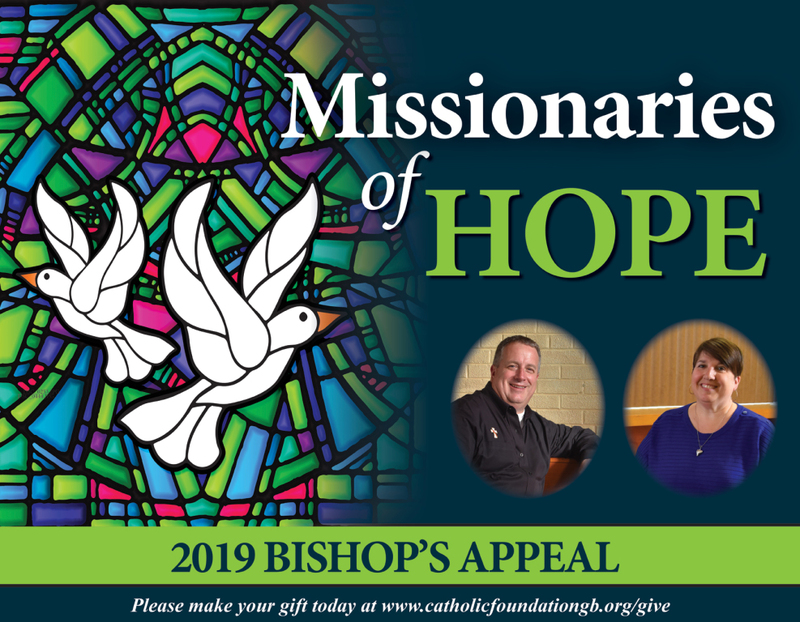 Please prayerfully consider making a gift to the Bishop’s Appeal. To make a gift to the Bishop’s Appeal pick up a donation card on the Bishop’s Appeal table in the gathering space, visit the Bishop’s Appeal website at www.catholicfoundationgb.org/give or call Tammy toll-free at 877-500-3580 ext. 8123. Thank you! What percent of the Bishop's Appeal goes to each area? These distributions from your gifts help fund the work of the Diocese for the fiscal year of 2018-2019. Catholic Charities serves the poor and needy people by providing outreach. New Evangelization Department reaches out and provides opportunities for people to embrace and to share their faith. Office of Marriage, Family Life & Pro-Life shares our Catholic teachings on life issues and helps strengthen families through Marriage Preparation. The Education Department provides Catholic schools and parishes the necessary tools to share our Catholic teachings with people of all ages. Parish Planning & Pastoral Services helps parish leaders through consultation, formation and resources for the growth of vibrant parishes. The Compass Newspaper provides news and information that educates people about our faith. Ministry Formation provides training and formation to hundreds of deacons and lay ministers. Diving Worship supports the liturgical and sacramental life of parishes by providing training for liturgists and musicians. Bishop’s Appeal receives funding so the Catholic Foundation can operate the Appeal to benefit the many ministries of the Diocese. Fundraising typically costs between 5% - 9%. As disciples of Jesus we are called to return to the Lord the gifts He has so generously given to each us. As stewards, we share these gifts through our prayers, service and generous sharing of financial resources. Thank You for your support of the Bishop’s Appeal!